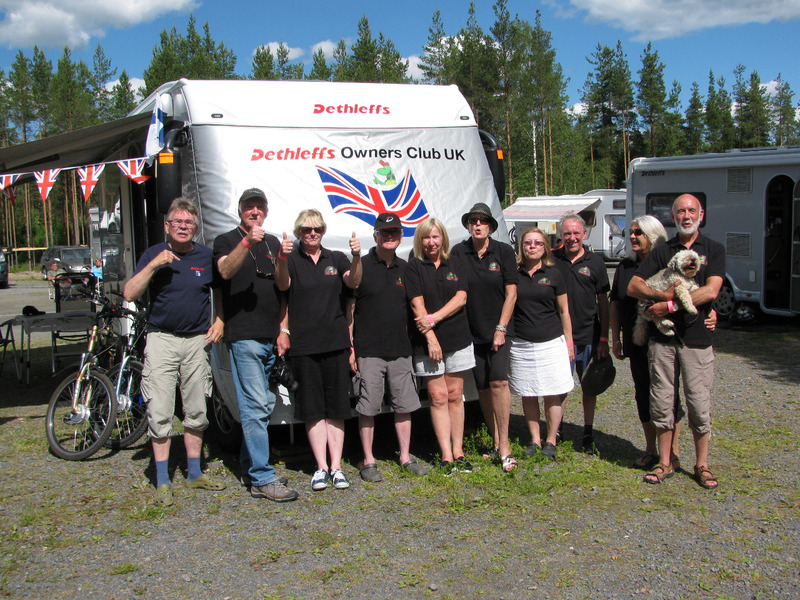 Dethleffs UK were formally invited to visit Dethleffs Finland Summer Rally. Amidst thoughts of “Where is Finland?”, “How do you get there?”, “ When is the Summer Rally?”, it was agreed that Summer 2017 was to be the date. 4081 miles later, I can share some of the experiences with you now. Four Deffy’s assembled via differing routes at a Finnish Lake side Camp Site half way up or down Finland at Kalarjarvi for three days of absolutely fabulous Finnish hospitality. Our own journey took Otto on the Tunnel following a three hour “technical delay” we set off at 17:30 and made for Brugge for the night, in company with Emily. 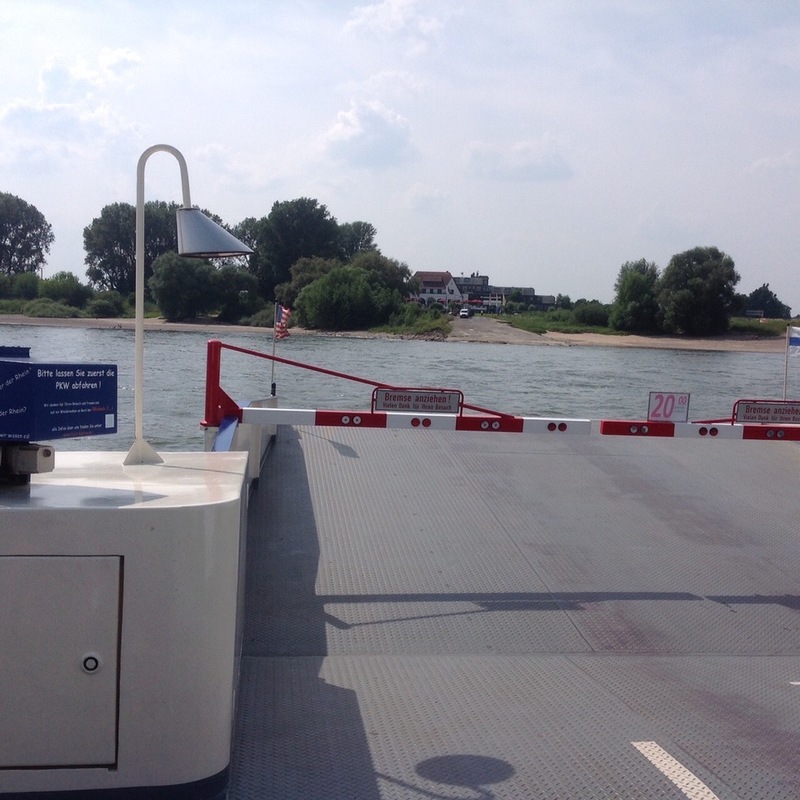 The German roadworks lived up to their fame and the second night was spent on the Banks of the Rhine , including a totally unexpected sat nav error that took us across the Rhine by a €4 ferry trip. 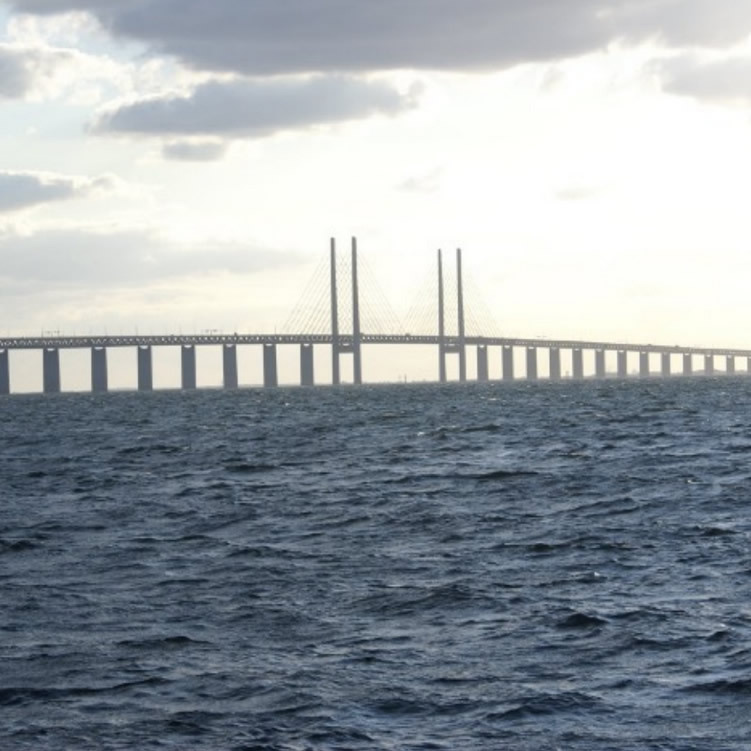 The next day took us to Puttgarden and the Scandlines Ferry to Rodby with the chance to sample their luxurious Scandinavian buffet. This led to our fifth country in three days ( France, Belgium, Holland, Germany and Denmark. ) The overnight stop in Denmark took us to Western Camp. This involved more drink and the lighting of bonfires on the beach. All of course in the pouring rain! 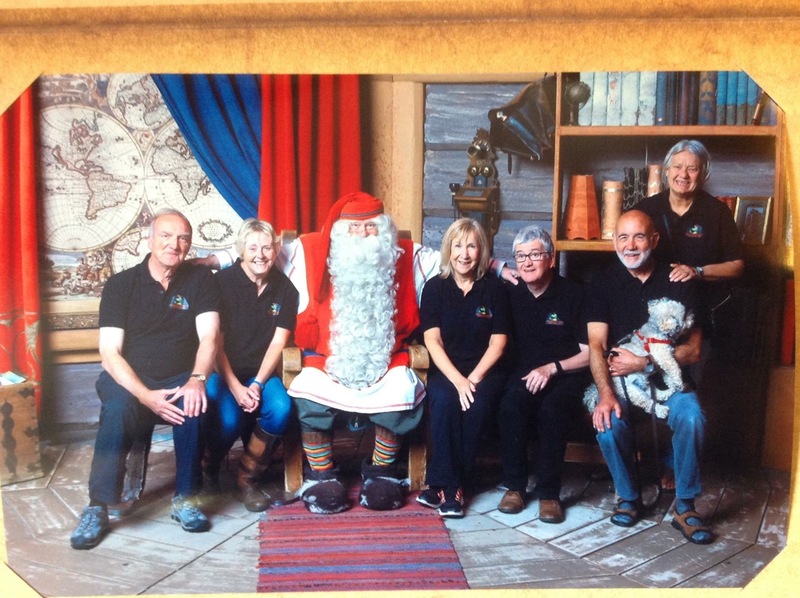 Three days later we arrived in Finnish Lapland where we met up with Colin & Bernice. 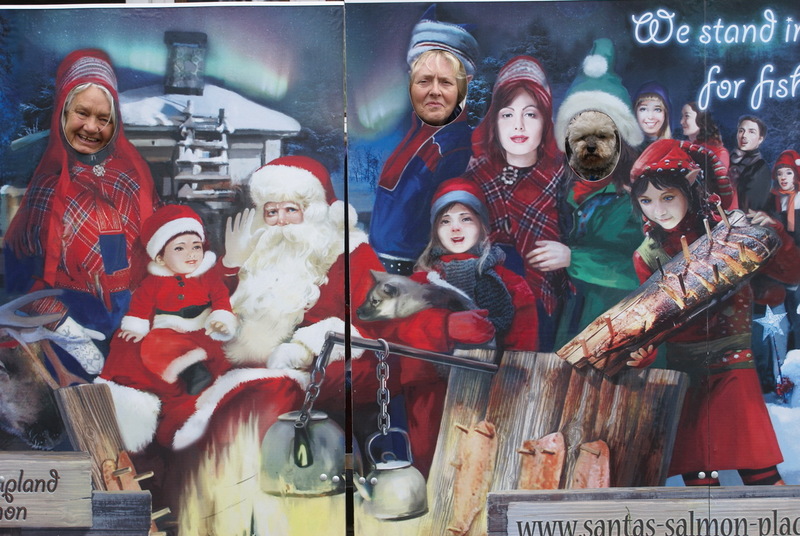 This took us onto the Artic Circle and certain other people’s residence. There was of course an official ARTIC CIRCLE CEREMONY. Then it was down to the Rally camp site, where arrangements had been made for us to stay additional nights for €20 a night and not the Caravan SF standard high season 30. 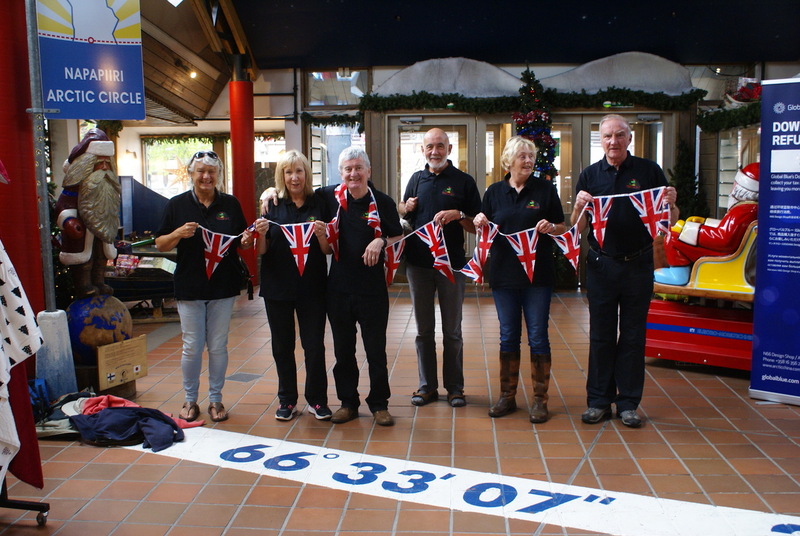 Here we met up with our fourth members Helen & Steve who had come via the French Moto GP. Excellent lake side facilities , modern no push button showers and of course the Sauna. We were introduced to a Finnish custom of the Long Table. This involves a barbecue being provided and a local firm donating ‘long sausages’ for you to cook to your own perfection. Additional’s were provided to make quite a substantial lunch, all eaten on the d.i.y long table. This was followed by a milking teat throwing competition seeing who could get the most into an aluminium full sized milk churn. The other part of collecting your pack of sausages was to register a ticket for the “Free Raffle” Yes , the sunshine is real! Interestingly enough, Dethleffs Finland do not have any subscription fees, nor does the “club” handle any money . Not sure how that works, but for example, all the Raffle prizes were “Donated,” including the folding bike! 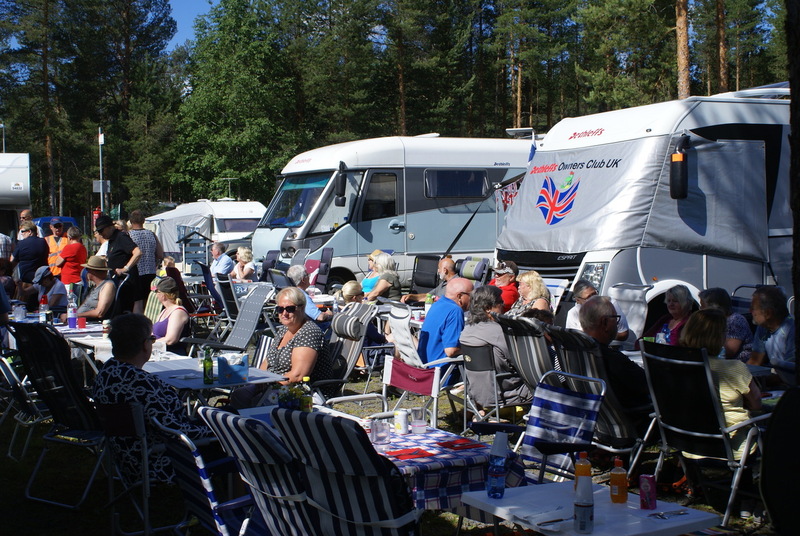 The other highlight of the Rally for us was that we were the first ever guests to be invited to join one of the Finnish Rallies. 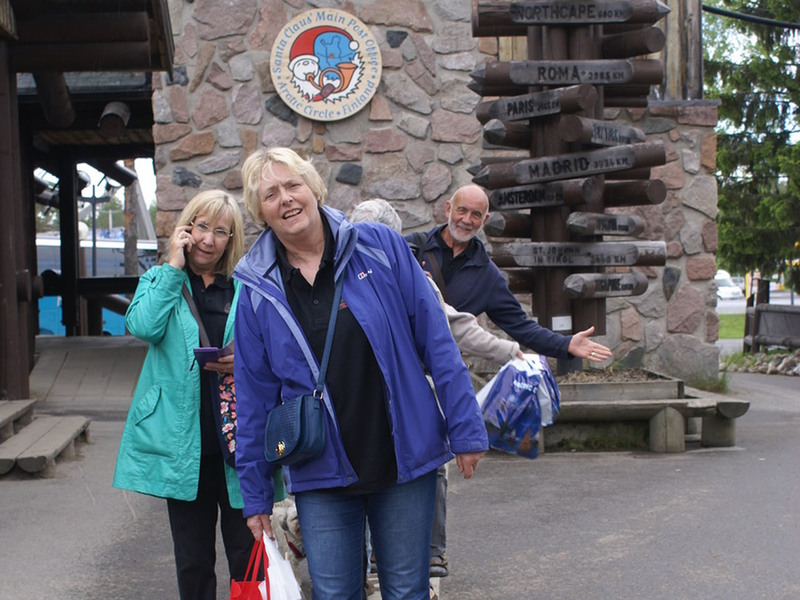 All our party were made most welcome by all and there was no end to their offers of help, or what to see in Finland . Even the Sauna challenge was accepted, although we were a little thin on representatives to swim in the lake afterwards. Otto did have a minor malfunction. On day two on the Finland site, we woke one morning to no 230 (Electric) in the van. Fortunately the inverter still worked so we were able to start the day with a cup of tea. Then the testing – It wasn’t the camps pole, or even two or three of them, it wasn’t Otto’s main fuse, it wasn’t the hook up cable, or Colin’s. Plenty of 12 v but no mains. The word got round and soon we had four Finns, none speaking English, in the wardrobe establishing an apparent fault between the incoming hook up fitted socket and the fuse board. The problem was solved with a section of cable being chopped from their Presidents spare hook up lead and a replacement cable from the hook up socket to the fuse board. Everything now fine on the 230 front, but I did discover later that the inverter now did not work. This is when I remembered that, (and not a lot of people know this) the mains hook up supply goes directly to the Inverter distribution board, and then a separate cable goes back to the vans electrics, via a 16 amp fuse. However we did have full mains power restored. On arrival back in the UK, Martin the Whispaire engineer examined everything and discovered that the fuse that controls the input power to the Inverter / van , had burnt out , just out of visual sight in its glass tube. He did not discover this himself until he put the meter across the fuse directly, having found no breaks in any cables and re connecting the Finnish repair. Thus another lesson, make sure you carry some form of circuit tester with you, and always start with a detailed test of the fuse!! Stock up on spare fuses. Of course we have returned the Invitation, but the main stumbling block seems to be driving on the “other” side of the road. One weird notion was explained, some of the chaps wanted to know why the Brits have white plates on the front of our vehicles and yellow plates on the back. I think I got away with it by explaining its how the Brits tell which is the back or front of their vehicle when trying to find it after a night out! The four days soon passed and we set off on our various routes home. 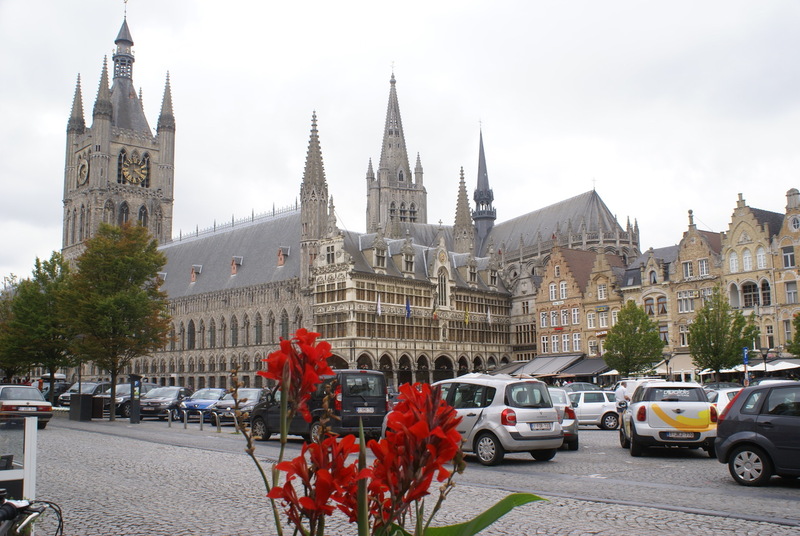 Otto substituted Ypres for Brugge on the way home. Wonderful ancient city on a town scale. In the city square, in front of the Cloth Hall, the sounds of Glen Miller could be heard pumping out. Most professional sound . 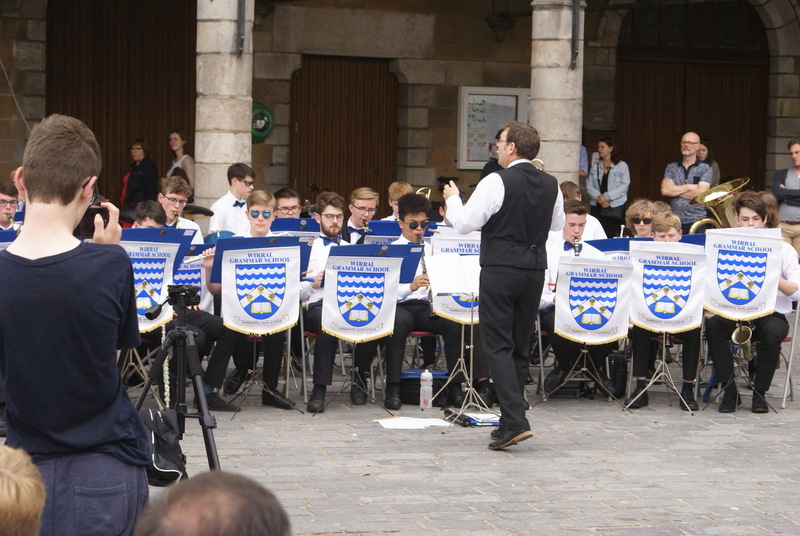 Imagine our surprise when the Musicians were the Wirral School Orchestra were playing on a tour of Belgium and Holland. That evening their choir, 3 clarinets and an alto sax, performed at the 8pm ceremony. A totally moving experience, and so good to see many younger folks there from across the world , marking the importance of the volunteer Fire Brigades daily tribute. For those that may know of it, but not the Why , this is the first memorial completed in 1927 and it commemorates 54,896 fallen Commonwealth soldiers with no known grave . Even more of a shock is that these are the figures up to 15 August 1917! I also asked the buglers ( Firemen) , why they do it and not any military take part. The reply was , when it first started, the Fire Brigade were the only units with Bugles , and so it has remained their privilege. On a personal note Wendy and I would like to say thank you for your company Mark, Mary, Colin , Bernice , Ollie , Helen and Steve , what a trip we all had . 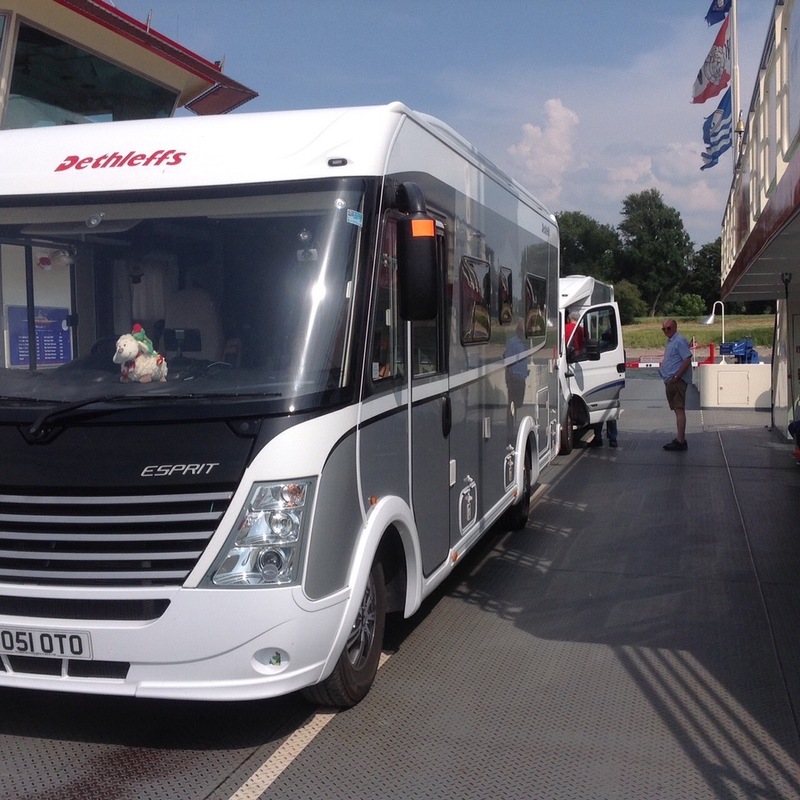 PS Helen and Steve had continued to Norway , via St Petersburg ( As we Deffy’s Do) . Also a big thank you to Reiko , Maria-Lisa, Arme and Michael of the Finnish Club , and to Timo Pilonen , the Executive Officer of Caravan SF for his input.